As a coach new to coaching youth soccer it is often difficult to manage players, parents, practices plans, and games. 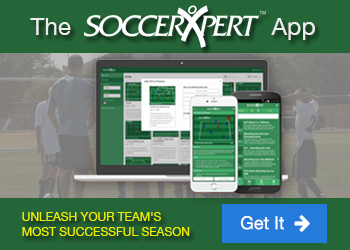 With our soccer coaching tips and articles, there is plenty of opportunities to learn. The good thing is other coaches have already paved the path to success and have proven coaching tips for those new to coaching youth soccer. These tips will help you develop skilled, confident players with a passion for the game. Soccer specific nutrition guide to help youth soccer players improve performance by eating the right things at the right time. Soccer skills are an important part of being successful in soccer. Soccer skills are simply the touch one has when passing, trapping, receiving, or shooting. These soccer skills can be improved though repetition and multiple touches on the ball. Want to know how to thigh trap a soccer ball. This step by step how to control a soccer ball withyour thigh is a great resource for teaching how to thigh trap. In order to keep possession in soccer it is critical that players master the art of maintaining possession. Since the chest is the largest surface of the body, it can easily be used to cushion the ball down to the players’ feet. Soccer shielding is an important dribbling technique often used to keep possession in tight spaces. Shielding occurs when the player in possession of the ball positions themselves between the ball and their opponent creating a barrier with their body. The player simply uses their body as a shield to keep distance between the ball and the defender. This soccer fitness drill is designed to improve lateral speed and agility required in soccer. Heading is an essential skill to learn in soccer. It is crucial for defensive players to clear balls from the back, midfielders to win critical battles in the middle of the field, and attackers to nod a ball past the opposing keeper to score a goal. As a youth soccer coach you should always take time to design and plan your practices. Soccer practice planning can be completed a week or so in advanced and will make your life as a coach easier.. Whether you have recently volunteered to coach youth soccer to spend time with your kids or because your child’s team desperately needs a coach you must understand that you have taken on a large task and you have plenty of work to do behind the scenes to ensure the perfect season. You have just taken on the job of teaching young kids the most popular sport in the world. In order to have a successful soccer season, it is important to foster good parent behaviors on the sideline. Some coaches are skeptical when they are asked to coach their child’s soccer team. The fear lies in the unknown. There are some important tips that will make your first time as a soccer coach a pleasant one for players, parents, and most of all you. How do youth soccer players learn the game? The answer is simple! They learn the game by watching, imitating, practicing and being tested during game play. Making a Lesson Plan - Design, Diagram and Make Sense: Get the know how on designing your soccer practice sessions, know how to make your own diagrams, and make sure the drill makes sense and focuses on the skill you are wanting to teach. As a soccer coach, I don’t have to tell you that coaching a youth soccer team while traveling in tournaments is a difficult task. One of the hardest responsibilities as a soccer coach while on the road is monitoring your players’ food intake. As their soccer coach, it is important for you as their coach to give the players a list of foods that will help their bodies recover quickly and give them the most energy for the following games. In soccer, the game is the best teacher. Focus your next practice sessions on soccer small sided games (1v1, 2v2, 3v3, 4v4) and get quick results. Team and player evaluation is a large part of being a successful soccer coach. From evaluating team and players abilities, we are able to focus in on our teams strengths and weaknesses and structure our training sessions around these findings. Evaluating a team should be done at all events, and is easiest done in match situations, or even better when done during training sessions. Should Soccer Players Warm Up and Cool Down for Practices? Soccer players of all ages should warm up before EVERY soccer event and cool down after EVERY soccer event. The number one reason revolves around reducing the likelihood of a soccer related injury. Although warming up is often overlooked by coaches of younger players, a good warm up and cool down should become part of a teams routine. Soccer season is around the corner and it's time to get prepared and make sure you have the tools to make your practices more successful. There are certain items that every coach needs to run a smooth successful soccer practice. This series of individual soccer skills focuses on individual touch and control. Improve your inside of the foot passing, outside of foot passing, thigh volleys, chest volleys, headers, and volleys. Soccer Dribbling is a very important aspect of soccer. Effective soccer dribblng will create goal scoring opportunities. Reat more for the effective dribbling qualities for soccer players. This tip will assist coaches to organize a soccer practice based on the age of the players, and answere many important soccer management related questions. This tip outlines training ideas to teach young soccer players how to defend with good defensive body posture. This tip details the importance of having a good first touch and how your first touch effects your time and space on the field. Why should soccer players eat foods that are high in carbohydrates? Find out what foods soccer players should eat and why it is important for soccer players to eat foods high in carbohydrates. Soccer Specific Agility and Speed Training Drills. Learning to defend in soccer is typically much easier than learning to attack. The ease of teaching defense is because the defender's primary job is to dispossess the attacker. The Fartlek (Swedish for "Speed Play") Training method is a great fitness tool that is excellent for soccer specific conditioning. To learn how to juggle a soccer ball there is one important tip; practice juggling. The more touches juggling, the better you will become. The success or failure of a team begins with supporting players. Properly supporting players with the ball requires early support from teammates without the ball by anticipating the play, reading the field, and knowing your teammates.